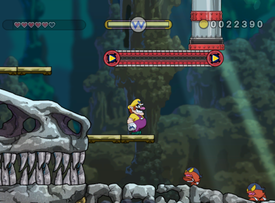 Stonetooth Cave is the second level in Rocking Range in the game Wario Land: Shake It! It is a huge underground cave filled with many rock structures. The cave is composed of dinosaur fossils, with T-rex and ammonite fossils being the most common. Stonetooth cave is also full of conveyor belts, which move Wario in the direction the arrow on the conveyor belt is pointing. Many enemies tend to walk on the conveyor belts. Bonfire Blocks and Flaming Wario are also first seen in this level. Once Wario gets to the caged Merfle, he will have to run all the way to the start of the level before time runs out. This page was last edited on January 16, 2019, at 11:34.